Last night was the preview of a new London brewpub on Torrens Street, just around the corner from Angel tube station in Islington. Formerly a gastropub called the Arc, it is now the first London base of a growing chain called Brewhouse & Kitchen which already has venues in Portsmouth and Dorchester, and will soon open a fourth in the former Junction pub in Highbury, just up the road from the Angel. B&K Islington is a big space on the ground floor of a modern building, decorated in an eclectic and only occasionally clichéd style: bare brick walls, bookcases, old suitcases turned into picture frames, and huge copper light fittings that bring brewing vessels to mind. And then at the back, there is the brewkit, all wood and steel – and looking awfully familiar. As well it should, because it's the same brewkit that used to reside in the Botanist on Kew Green and was ripped out by pubco M&B after it bought the Botanist and the other pubs owned by the small Convivial group. Even better, M&B also ripped the brewkit out of the Lamb in Chiswick, and that's being installed in B&K Highbury, so that's two lost breweries returned to the city. It's a little convoluted, but as I understand it, two of the directors of Convivial – which was London-focused – had also set up B&K as a separate company to develop a similar gastro-brewpub format elsewhere. 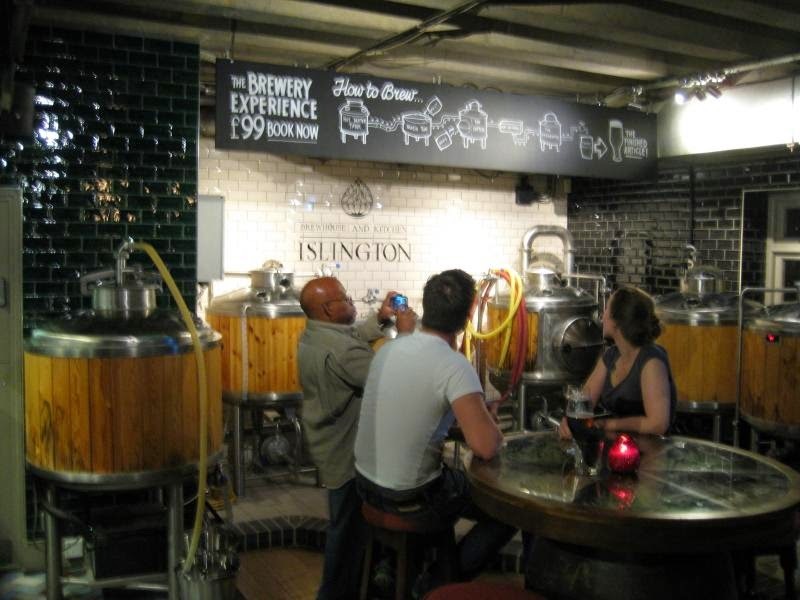 Since then, B&K has been buying up whatever pub-scale brewing kit it can, ready for new sites as they come along – Islington head brewer Peter Hughes (who is ex-Mighty Oak Brewery) said there's still two or three breweries in storage. Also on-board with B&K is Mark Wainwright, the original head brewer from the Botanist and now in Dorchester, while the former manager of the Botanist is now running B&K Islington. Anyway, the new brewpub opens to the public next Monday (October 6th). There was a reasonable range of ales on at the preview, albeit a fairly 'safe' one, and only the Spandau B session IPA was actually brewed on site. Peter's done several brews there already, but reckons it can take you a dozen to get used to a new brewkit. For instance, when you move liquid between vessels there's a temperature drop which will affect things such as the attenuation, so you could end up with a thinner but more alcoholic brew than you wanted. While your experience as a brewer lets you make a good guess, only knowing the brewkit well will get it right. He added that it took him two days just to get the brewkit clean and replace various pumps and seals – M&B had left it idle for months before selling it, and then it was in store. And he talked of plans to exchange beers with B&K Highbury – the six-barrel brewkit going in there is capable of brewing lagers, whereas his 2.5 barrel kit is for ales, so it would make sense. The beer variety will very likely increase too – Peter is friendly with the brewers at West London's Weird Beard, for example, so he's no stranger to interesting and/or hop-forward craft ales. Fingers crossed... All in all, this is a very promising start, with a lot of investment and an experienced (and very multinational!) team involved, and I look forward to revisiting in a couple of weeks to see how it is going.